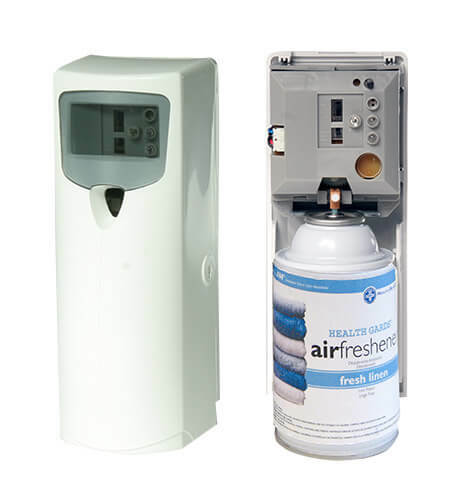 Unique in its design, our Metered Mist™ Automatic Aerosol Dispenser is designed for a smaller wall footprint than most dispensers in the marketplace, providing a more subtle, discreet approach to wall-mounted air freshening appliances and a programable, controlled release of V.O.C. compliant aroma vapor via our metered mist aerosol refills, which contains our patented, molecular odor neutralizing additive, Metazene. Its resistant polymer construction will not break down or melt away from the overspray of an acetone based formula, and it offers 24-hour/day (light sensing) modes of operation servicing up to 6,000 cubic feet. The spray timer adjusts to release mist at 5, 10, 15 or 20 minute intervals. It has a longer-lasting battery life and uses one or two AA batteries. Larger 7 oz. fill plus higher fragrance load! The Metered Mist™ Air Freshener dispenser utilizes our 30-day aerosol refills and feature the science of molecular odor neutralization. They are specially formulated for public restrooms and large rooms environments of up to 6,000 cubic feet. It’s universal spray actuator nozzle provides 30 days of continuous deodorization with each time mist. Cinnamon Spice, Citrus Grove, Fresh Baby Powder, Fresh Garden, Fresh Linen, Fruit Basket, Mango Madness, Neutralizer, Orchard Spice, Sunburst, Tropical Trade Winds, Very Vanilla and Vineyard.